The newspaper tells me that this article is one of a series entitled “How to Do the New Winter Dance Steps.” I am always grateful when the papers announce the existence of a series. It’s even better when they number the lessons, so I know if I’m missing one. These articles, and others of their ilk, appear to have been syndicated pieces published by regional papers around the United States. Some publications printed series such as this one consistently – for example, each lesson in a series might appear on a weekly basis in the Sunday paper. Most papers, however, appear to have taken a more relaxed and sporadic approach, sometimes switching days of publication, sometimes skipping a lesson entirely, sometimes dropping the series for a month or two before resuming at a later date. The Seattle Star seems to fall into the latter category. Needless to say, this makes hunting these articles down a bit more complicated. Not impossible, but complicated. Want to kill an evening? Try doing a word search for “dolly sisters” at Chronicling America. 2,556 entries. The ladies were busy. Although the The Seattle Star claims that the famed sisters wrote this article “especially for The Star,” the piece ran in a number of other newspapers across the country. A nearly identical article, for example, was published in The Tacoma Times a few weeks later, with similar claims that it had been especially written for that paper by the Dolly Sisters. We can only assume that everyone involved was confident the readers of The Seattle Star were in little danger of also reading The Tacoma Times. The Dolly Sisters are pictured, above, in what, I assume, is one of the signature poses of their eponymous dance. If their writing style and name are any indication, the Dolly Sisters were trendy and a little precious. 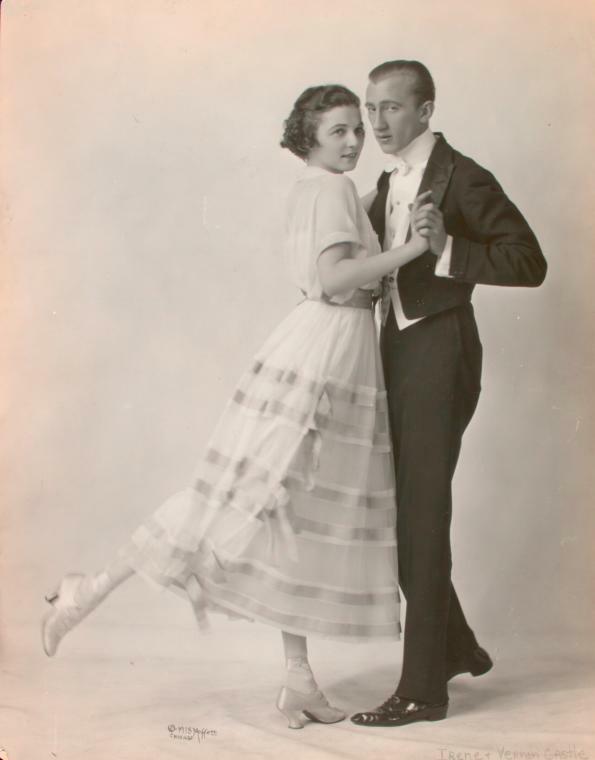 “[I]f you wish to waltz in some fashion other than that of the dark ages,” the sisters write, “then you must have in your repertory of dance figures steps and movements that were unknown a few years ago. We sisters have originated a waltz that satisfies those who wish ‘something different’ and very modestly we call it the Dolly waltz, after a little dolly perched in our dressing room in at the theatre.” There you have it. Either they named the waltz after themselves, or after the doll in their dressing room. Or perhaps they named themselves after the doll in their dressing room? Or there’s a doll in their dressing room to remind themselves of their name? So many options. The ladies have kindly provided both a step by step diagram of the Dolly Waltz figures (around the central photograph, above), as well as a detailed explanation of the positions. Although the drawings depict a lady and a gentleman dancing together, the sisters state at the end of the article that the dance could just as easily, or even preferably, be performed by two ladies. This doesn’t seem to be particularly unusual. This video, for example, shows two ladies dancing together in 1908 (although one of them is dressed as a man, which is a bit unusual), and this one, posted on youtube by Walter Nelson, shows a number of female dance partnerships in 1939. The gent, “throw(s) weight on right foot,” steps onto the L foot on count 2, while simultaneously turning 180 degrees. I imagine this is some sort of toss across. The sisters don’t specify what the lady is doing during this step, although the diagram implies that she also executes the step. Repeat 6 on the opposite foot to return to the couple’s original position. Staying connected, drop extended arms (gent’s L, lady’s R). The gent places his L arm across his back. The lady crosses her R arm across the front of her body and takes hold of his L hand. Hope your arms are long, gents. The gent releases his R hand from the lady’s back, and completes a waltz turn, I assume over L shoulder, to return to the lady, who has remained motionless. Repeat 9, with the lady making the waltz move. The couple “drops into place” for the skating step. With hands either crossed in front, or open side-by-side position waltz position, the couple skates L, hoping and turning R R. This can be repeated ad nauseum. The couple ends their skates face to face, R hands crossed above their heads, L hands on hips. Step point back and forward. They make a half turn, then reverse it. I will admit to being underwhelmed by the Dolly sisters’ way with the written word. I found their descriptions to be needlessly complicated and somewhat obtuse. Of course, it could simply be that I’m obtuse. Ultimately, I think this dance is a variation on the Hesitation Waltz of a few years prior, but hoppier, and with funkier arm work. So, not the old waltz of the nineteenth century, but also not entirely new. The cover picture for this post is a still from the Dolly Sisters’ 1918 film The Million Dollar Dollies, in which they played themselves. It was provided by Wikimedia Commons.